Mini Malt Cakes — always with butter. Ok, so I made these mini cakes as just a practice for me on frosting. The little oreo buttercream one came out better than the raspberry one, because the raspberry buttercream was too soft. But I only realized that half way through frosting so I just had to go with it. And there were supposed to be three mini cakes, one totally oreo, one totally raspberry and then a little mixed love child. But the fully raspberry one didn't survive, it was too much Leaning Tower of Pisa, so I just ate it! I refer to my ability of cake decorating as Dr. Seuss went to Paris. (not saying mine are fantastic little parisian patisserie creations, as I wish they were) I always just try to make them the little desserts of my memories of Paris, but they come out a bit... wobbly. Oh well, just means I have to start making more cakes! Which I am completely good with. The malt cake in this came out different than when I have used malt in other recipes. In a good way. The malt flavor wasn't too strong but made the cake have a rich pudding cake. Very moist and thick. The raspberry buttercream layered with the oreo buttercream was surprisingly very tasty! I was just thinking of two different frostings to use, so I thought of what would I get in a malt milkshake at a diner? Then strawberry came to mind, then I thought 'Wait, raspberry might be a nice change' and then of course and oreo malt milkshake, a classic in my option. 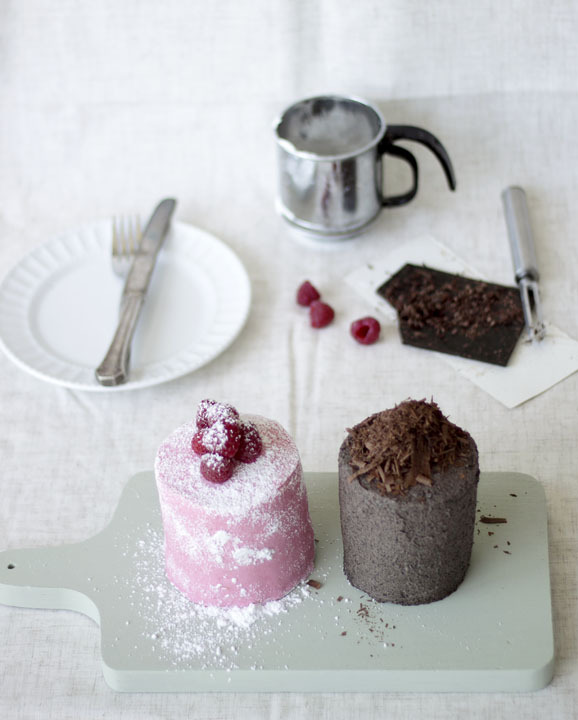 So go make some little cakes this weekend, mix and match the frostings and indulge. Oven 325F. Butter and flour two 8 inch cake pans. Whisk malt powder, flour, cocoa, salt and baking soda. Set aside. In a large bowl, whisk eggs, sugar, oil and vanilla. In alternating batches, mix flour mixture and milk into egg mixture. Divide evenly among pans then bake for 45 minutes until a toothpick comes out clean. Combine all ingredients in a food processor and blend until smooth. Add more sugar or cream depending on thickness.